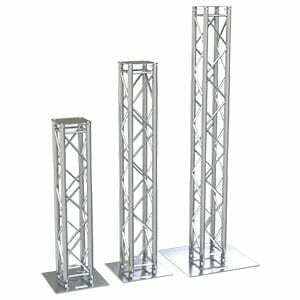 Aluminum Lighting Truss, Large Screen Display Truss, and Entryway Truss Systems available for rental. Each 8 foot truss is not only perfect for displaying large screen monitors or TV displays but also as an add on for impressive Karaoke systems for larger crowds and corporate events. Likewise, each 8 foot piece can act as an entry column when covered with white material and colored uplights are added (see Glow Totem photo below). This lighting equipment rental has multiple purposes to make your party or event look professional and larger than life! Check out our Lighting Rentals and Monitor Rentals here to create some of these looks below. You may also be interested in renting a Stage, Stage Stairs, Stage Skirts, Battery Powered P/A, or DMX controllers to complete your event.